Just what IS extra-virgin olive oil? I am asked this question in most of the cooking classes I teach. So here is a brief but informative feature on this essential Italian ingredient. Nearly all my recipes (both those in my cookbooks and in my cooking classes) call for extra-virgin olive oil. I use it raw, cook with it, fry in it... But why should I specify extra-virgin, rather than virgin, pure, or light olive oil? The reasons are simple: flavor, quality, and healthfulness. Extra-virgin olive oil is produced according to stricter guidelines than virgin, pure, or other olive oils, using the best that the fruit has to offer. It has deeper flavor, a more lingering aroma, and a more distinct olive character than other olive oils--therefore, you need to use less in any given recipe, because it delivers more flavor per tablespoon. The olives are picked when ripe, sent to the mill within a day of picking (so the fruit does not begin to deteriorate), and crushed mechanically by giant stone wheels. The resulting mash is spread onto thin mats which are stacked in a stainless steel press (in the old days, and in some traditional mills, presses were made of wood). As pressure is applied, oil and water seep out; since no heat is used, this oil is called "first cold pressed." After pressing, water and oil are separated, and the oil may or may not be filtered to remove small bits of fruit or pit (some prefer unfiltered olive oil, maintaining that the unfiltered fruit particles lend the oil extra flavor; others say that unfiltered olive oil has a shorter shelf life than filtered olive oil). The oil is then bottled and sold as "extra-virgin olive oil." Oils that do not meet the criteria for "extra-virgin" after pressing are sent to a refinery where defects in color, taste and aroma are removed by industrial processing. When olive oil is refined with the aid of chemicals, it becomes colorless and tasteless and loses its distinct character; this inferior oil can then be blended with some virgin olive oil (which provides color and flavor) and then sold as "pure" olive oil. "Light" and "mild" olive oils are also made this way, using chemical processes and solvents, but less "virgin" oil is added to rectify flavor and color. Extra-virgin olive oil is required by law to have no more than 1% percent acidity (or, in more technical terms, less than 1% free oleic acid), which makes it more digestible and healthier than virgin olive oil (2% or less acidity) and pure olive oil (higher than 2% acidity). Acidity in olive oil is directly correlated to production methods: when olives are picked mechanically or bruised before they are pressed, or when the olive oil oxidizes, acidity levels increase. Therefore, lower acidity is an indication of better quality. Oils that are judged deficient after the pressing are sent to a refinery where defects in color, taste and aroma are removed by industrial processing. All olive oil--whether extra-virgin, virgin, or pure--has the same number of calories: 120 per tablespoon. Steer clear of olive oil labeled "light," which have the same calories but a much blander, nondescript flavor and higher acidity than extra-virgin olive oil. Light olive oil has so little flavor that you are forced to use more in order to make your dish taste even vaguely like olive oil. If you are looking for a mild olive flavor in your oil, try buying extra-virgin olive oil from Liguria--made from Taggiasca olives that are picked very late, it is milder in flavor than most other Italian extra-virgin olive oils. One tablespoon of olive oil contains 120 calories, 14 grams of fat, and no cholesterol. A whopping 77% of the fat in olive oil is monounsaturated; 9% is polyunsaturated fat; 14% is vegetable-derived saturated fat. Virgin olive oil also contains antioxidants (beta-carotene and Vitamin E) and phenolic compounds (tyrosol and hydroxytyrosol). By comparison, 1 tablespoon of butter contains 12 grams of fat, of which 8 grams (66%) are saturated fat; in addition, a serving of butter contains 33 mgs of cholesterol. Saturated fat and cholesterol have been linked to increased levels of low density lipoproteins, or LDLs (the "bad cholesterol"). Margarine contains approximately 10 grams of fat per tablespoon, but in order to solidify the vegetable oils used to make margarine, the oils have to be hydrogenized, thereby creating potentially hazardous trans fatty acids: trans fatty acids increase LDLs and lower high density lipoproteins, or HDLs (the "good cholesterol"). Scientists agree that extra-virgin olive oil is the healthiest fat around. Studies have shown that olive oil consumption is linked to lower rates of heart disease, cancer, and arteriosclerosis, as well as an increase in the functioning of the immune system. The olive tree has grown wild in the Mediterranean basin for millions of years and was the first plant to be actively cultivated in the Mediterranean. Called "Liquid Gold" by Homer, considered sacred by the Cretans, and offered to the winners of the Olympic Games in ancient Greece, olive oil has a long and venerable pedigree. 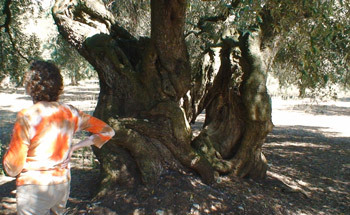 Fossilized remains of the ancestor of the olive tree have been discovered in Livorno, Tuscany, dating to 20 million years ago. 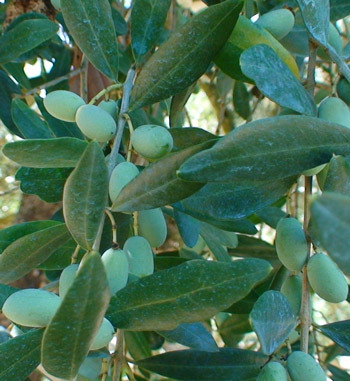 Archaeologists and historians postulate that olive tress were first cultivated in the Eastern part of the Mediterranean as long as 10,000 years ago and that olive cultivation later moved westwards, reaching southern Italy around the eighth century B.C. Greece was the most heavily cultivated area in the Mediterranean until 1,500 B.C. and the Greeks built special vessels and amphorae in order to transport olive oil from Greece to its numerous trading posts around the Mediterranean. The Romans divided their vast empire according to olive oil markets, and the peoples they conquered were forced to pay taxes in olive oil to their new rulers. The ancient Romans subdivided olive oil in five categories according to the quality of the olives used: oleum ex albis ulivis was from green olives; viride was from olives which were beginning to blacken; maturum was from ripe olives; caducum was from olives fallen on the ground; and cibarium was from rotten olives, meant to be consumed by slaves. Used to light lamps in temples, to anoint the dead before burial, to prepare medicinal elixirs believed to confer strength and youth, and infused with wild grasses, herbs, and flowers to provide both cosmetics and medicine, olive oil has been far more than mere food across the Mediterranean for the last 10,000 years. Over the millennia, it has continued to play a pivotal role in the culture, economy, and cuisine of the entire Mediterranean basin--and although today olive oil is prized mostly for its culinary virtues, it remains one of the Western World's most mythical, powerful, and alluring ingredients. Consider what Lawrence Durrell wrote in Prospero's Cell: "The entire Mediterranean seems to rise out of the sour, pungent taste of black olives between the teeth. A taste older than meat or wine, a taste as old as cold water. Only the sea itself seems as ancient a part of the region as the olive and its oil, that like no other products of nature, have shaped civilizations from remotest antiquity to the present." Olive oil, like wine, is a product of nature whose character varies greatly depending on where and how it is made, not to mention what varietals are used. Experiment with different olive oils to determine which best suit different preparations: a mild olive oil is ideal for delicate dishes, a fruity-spicy one for boldly flavored ones. I have four or five olive oils in my pantry at all times, which I pair with food much as I do wine. A good extra-virgin olive oil is ideal for sauteeing, frying, drizzling raw over salads, and even baking olive oil-based desserts like Tuscany's famed Flatbread with Grapes. Be sure to buy only extra-virgin olive oil (avoid virgin, pure, or light olive oil--see above) and, for best results, store your olive oil properly (see below). As for most foods, heat and light are olive oil's natural enemies, causing the oil to deteriorate faster than it would otherwise and to oxidize, eventually becoming rancid. To slow down the inevitable deterioration process, store olive oil away from light and heat; a pantry far from the stove is ideal. You can store olive oil in the refrigerator if you don't plan on using it within a year of purchase (something I've never done, since I go through a few bottles a month! ); the oil will turn cloudy and firm up in the refrigerator, but will return to its normal, clear liquid state when it is brought back to room temperature. Olive oil oxidizes over time and will become rancid if stored for too long; the average shelf-life of olive oil is 18 months from the date of bottling, as long as it is properly stored. Experts say you can tell if olive oil is rancid when it tastes like pumpkin (I find rancidity fairly easy to detect: the oil tastes bitter and aggressive on the palate and is no longer fruity in flavor). Some bottles of olive oil have a production date stamped on the label, but most do not, so you are better off buying your olive oil at a store that has a good turnover if you want to be sure the oil you buy was recently bottled. As olive oil ages, it loses its pronounced fruitiness and becomes more delicate in flavor. In the first few months after pressing, olive oil is pungent, fruity, and deep, and its color is dark, tending to green. 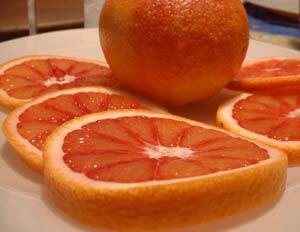 Within 4 or 5 months, its flavor becomes a touch milder, its color less intense. After a year, the fruitiness gives way to a mellow olive flavor and the color changes to a golden hue. After 18 months, much of the olives' lingering aroma has dissipated and the color of the oil is far brighter, almost yellow. In Italy, the annual olive harvest remains cause for celebration, and people gather to pay homage to the olive tree's prolific fruit at country festivals and outdoor fairs. The ultimate treat (and the manner in which farmers still judge the quality of the year's harvest) is a thick slice of wood-grilled bread drizzled with just-pressed extra-virgin olive oil. A common misconception is that extra-virgin olive oil is only meant to be used raw, not for cooking. I couldn't disagree more: I use extra-virgin olive oil for EVERYTHING in my kitchen--from appetizer through dessert, from drizzling raw over a platter of grilled vegetables to sauteeing and deep-frying... I even bake desserts with extra-virgin olive oil. If you like the flavor of extra-virgin olive oil, there is no reason to relegate it to the "raw use" category only: try extra-virgin olive oil in your pan sauces, rub it on meat before grilling, add it to marinades, deep-fry your crab cakes in it... While it is true that the organoleptic characteristics of extra-virgin olive oil are more pronounced when the oil is savored raw (that is, its distinct qualities, such as an artichoke or almond blossom aroma, are subdued when the oil is subjected to heat), extra-virgin olive oil nevertheless brings more fruity olive flavor to the plate than any other oil. The inimitable flavor of extra-virgin olive oil more than justifies the difference in price compared with other bland oils--not to mention the fact that extra-virgin olive oil, being an entirely natural product obtained by mechanical pressing of olives, is far more healthful than chemically or industrially extracted vegetable oils. This delicious soup was prepared by Umbrian chef Angelo Maria Franchini at our NYC cooking school in November 2008, as part of the Monini tasting, during which we had the opportunity to taste the season's fresh pressed olive oil direct from Spoleto, Umbria; this amazingly fragrant olive oil goes by the name Il Monello. The clean flavors of the soup are a perfect vehicle for showcasing fruity extra-virgin olive oil. 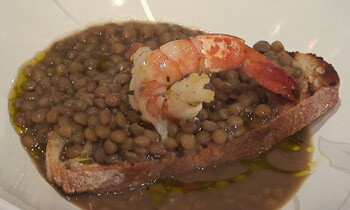 Make the soup: Rinse the lentils, pick them over, and set aside. Warm 2 tablespoons of the olive oil in a 2-quart pot with the onion, rosemary, parsley, garlic, and chili. Cook 10 minutes over medium heat, or until the onion is translucent. Add the tomato, lentils, and broth, season with the salt and pepper, and bring to a boil. Cook 30 minutes, or until the lentils are tender. Adjust the seasoning as needed. Make the bread: Heat a grill pan over high heat for 5 minutes and toast the bread until browned lightly on both sides, turning once, about 2 minutes per side. Rub the bread lightly with the garlic. Drizzle with the olive oil. Divide the bread among 4 bowls. Make the shrimp: Toss the shrimp with the salt, rosemary, parsley, garlic, and chili. Heat the olive oil in a small skillet until hot but not smoking. Cook the shrimp until it is pink and cooked all the way through, turning once, about 1 minute per side. Set aside. The dressing for the unusual winter salad below is nothing more than good extra-virgin olive oil, salt, and freshly ground black pepper. The pomegranate seeds look like ruby jewels sitting atop the fennel and orange. This is a staple in Italian homes for Hanukah. A quick marinade in lemon juice lends a pleasant tang; you can add minced herbs while marinating if you like. Be sure to use extra-virgin to fry the chicken for a truly delicious flavor. 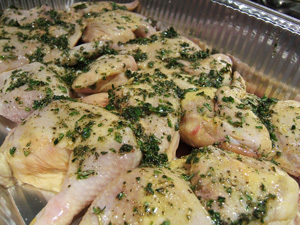 Toss the chicken pieces with the lemon juice, salt, pepper, nutmeg, and 2 tablespoons of the olive oil in a large bowl. Set aside for 1 hour. Heat the remaining 2 cups of olive oil in a deep 14-inch sauté pan over a medium-high flame. Dredge the chicken pieces in the flour, shake off the excess, and then dredge in the beaten egg, coating all sides. Place in the hot oil in a single layer, presentation side down, being careful not to splatter yourself. I love fresh sage. I infuse roasted chicken with its woodsy scent, throw in a handful of leaves whenever I make a batch of barley soup, mince it and scatter it atop potatoes before placing them in a hot oven. A few years ago, I had my first taste of deep-fried sage leaves in Tuscany: two whole leaves sandwiched together, hiding a little nugget of anchovy, dredged in an egg batter and fried until golden. Well... I was hooked. I included the recipe in my cookbook and after years, it remains one of my favorite palate-teasers. But, like any true sage lover, I knew there had to be another way to indulge in my taste for fried sage. And then it hit me: why not enclose sage leaves, simple and unadorned, in a thin sheet of dough and drop them into bubbling olive oil? I tried it, and it was delectable... Light, savory, and absolutely addictive. The dough I use for these fritters is very easy to make: just flour, salt, water, and a little olive oil. The ingredients are kneaded until a smooth dough forms, then rolled into nearly transparent sheets, cut into rectangles, and topped with a single sage leaf each. The rectangles are folded in half, fried in hot olive oil until they puff up and become gorgeously golden all over, and served with a mere dusting of sea salt. Heaven with a glass of Prosecco di Valdobbiadene. Make the dough: Place 1 cup of unbleached all-purpose flour, 1/2 teaspoon of salt, and 2 tablespoons of extra-virgin olive oil in a bowl. Add 1/2 cup of room-temperature water; the dough should come together. 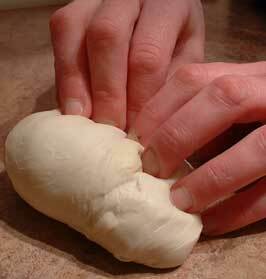 Knead for 1 to 2 minutes, adding water if the dough is dry or flour if the dough is sticky. The dough should be soft and supple, or you will not be able to roll it out until it is nearly transparent later; resist the temptation to add a lot of flour, and do not overwork the dough or it may be tough later. 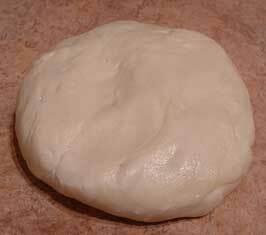 Pat the dough into a disk and roll out into a nearly transparent rectangle on a lightly floured counter. Rinse and blot dry 36 perfect, large sage leaves. 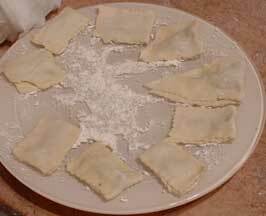 Cut the dough into rectangles a little wider than the sage leaves using a fluted pastry wheel. 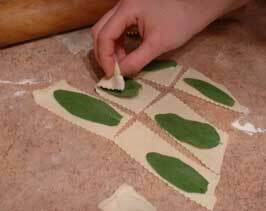 Top each dough rectangle with a sage leaf. If you like, top each sage leaf with a piece of anchovy fillet (I prefer the fritters this way--and, surprisingly, so do avowed anchovy haters!). 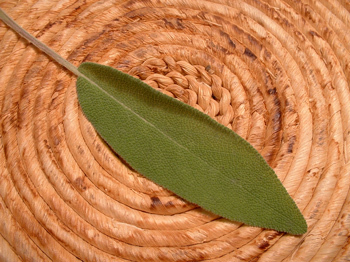 Fold each dough rectangle in half to enclose the sage leaf. 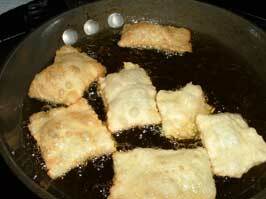 Be sure the edges are sealed well or the fritters might emerge from the oil soggy. Arrange the sage rectangles on a lightly floured plate or tray in a single layer; do not stack them or they will stick together. Heat a generous amount of extra-virgin olive oil (at least 2 inches deep) to 350 degrees in a deep pan; use an oil thermometer to gauge the temperature of the oil. It is important that the oil be hot (between 325 and 375 degrees) when you fry food, or it will fry up heavy and imbibe too much oil. Lower the sage rectangles into the hot olive oil, being careful not to crowd the pan. If you crowd the pan, the temperature of the oil will drop significantly. Turn the sage rectangles over when they become golden on one side and continue to cook until they become golden all over, about 2 minutes per batch. Remove with a slotted spoon to a platter lined with paper towels and blot dry.